"A delicious and skinny take on a creamy, indulgent pasta dish baked in the oven." Bring a large pot of lightly salted water to a boil; add shells and cook, stirring occasionally, until tender yet firm to the bite about 9 minutes. Drain. Heat olive oil in skillet over medium-high heat. Cook chicken with oregano, Italian seasoning, red pepper flakes, salt, and pepper until no longer pink, about 5 minutes. Add chicken broth, tomato sauce, cream cheese, Parmesan cheese, onion, goat cheese, cheese wedge, and garlic. Bring to a simmer and cook until well combined, about 5 minutes. Remove from heat and let cool for 5 minutes. Pour 3 to 4 spoonfuls of the chicken mixture into the bottom of a baking dish to prevent the shells from sliding. Stuff remaining chicken mixture into shells and set in the baking dish with the stuffed side up. Sprinkle top of shells with mozzarella cheese. 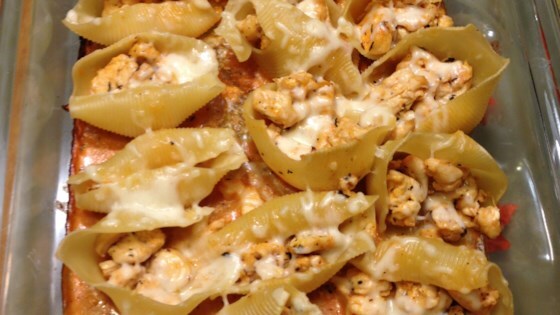 Bake shells in the preheated oven until mozzarella cheese is melted, about 20 minutes. Bulk up mixture by adding mushrooms and/or other vegetables. If there is any leftover mixture after all the shells are stuffed, add extra chicken broth and/or water to remaining mixture. Bring to simmer in a pot and pour over stuffed shells before baking. The taste was good but it was super dry. I mixed the shells instead of stuffing them to save time. It needs 3/4 cup of tomato sauce instead of just 1/4. Couldn't find gluten free shells, so layered it with gluten free pennee. Doubled the recipe, increased the amounts of cheese to taste. It was delicious. A definite "do it again". I cut the chicken into tiny pieces. Delicious! I was in a hurry so served with pasta instead of stuffing shells. Used a little extra cream cheese and broth because did not have the wedge and goat cheeses, and the taste was still delicious.